The wonderful Andrea from One Yoga Studios in Chorlton, with me, preparing for a Jivamukti-Gong session…..
A gong bath can be a fantastic addition to a yoga session. 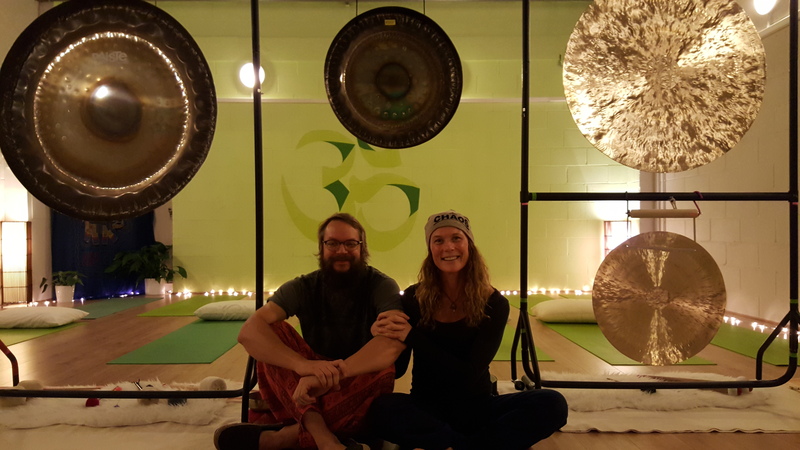 Depending on your choice, the gongs can play throughout the session, giving rise to wonderful sensations when flowing or holding postures, or alternatively the gongs can be saved for a time towards the end of the yoga session, when the participants have completed the main body of their practice and are ready to deepen their experience through the sounds. Yoga and gongs complement each other so successfully because their goals are inherently related. Both can provide relaxation, the opening of awareness and meditation and an inspiration to live well inside and outside of the studio. If you’re interested in using a Gong Spa to enhance the experience of your yoga students, please feel free to contact me to discuss further. You can make occasional bookings or regular slots as required.